This doll trunk has a Poplin exterior featuring our signature textured paper, "Leather" trim, Brass protective feet, Wood base, Satin ribbon to hold doll and secured with metal loops. Dolls will not pull paper from frame. Ribbons can be optionally changed. Double clothes rod maximizes storage capability on both sides of trunk, while still being able to hold one's doll. May be used as an armoire. No sharp corners with velcro on back of drawers to prevent falling out while in transit. The slim black leather carrier measures 26” in length and features silver embroidery on the exterior. The bag is specially designed to protect ball-jointed dolls, but will protect any delicate doll. Thick padding, doll-securing interior straps, and adjustable and detachable carrying straps are just a few of the bag’s other features. “We design our products with longevity in mind,” Ashley of The Doll Case Company’s sales and marketing department told TDmonthly. Launch date: July 2007. This 18” leather carrier is designed to protect the most precious dolls. It was created for ball-jointed dolls, but would be perfect for any delicate doll. It has thick padding on the inside and two straps to secure the doll while traveling. The bag’s metal feet protect it, and it can be carried horizontally or vertically, depending on placement of the adjustable and detachable straps. A 23” black version with silver embroidery is coming soon. 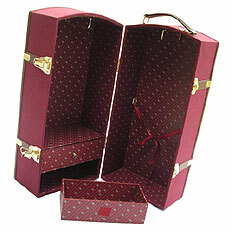 “Our company has been designing doll carriers since 1998. 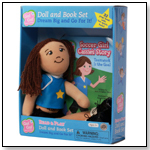 We design our products with longevity in mind,” Ashley Walicki of The Doll Case Company told TDmonthly. Launch date: March 2007. Our hangers are specially made to fit our trunks, however they do fit in a variety of other trunks as well. They measure 6 or 3 inches and come in a variety of colors. Also notice that not only can they hold dresses and shirts, but pants can drape through the opening! Doll Duffels are portable, lightweight doll trunks that keep your precious doll and expensive accessories together for long or short trips! Doll Duffels® feature zippered pockets for your doll's accessories, a deep pocket for your doll (enough for two dolls) and hanger loops for her clothes. The entire duffel zips closed, protecting the doll. The PVC exterior wipes clean with a damp cloth and mild detergent, and is virtually waterproof. The PVC Doll Duffel® includes 6 hangers. These Foam Carriers are the perfect solution for durable, lightweight storage and transport of dolls and their accessories. They weigh in at about 1 pound each.They are available with 2 closure options: zipper or buckle. These carriers are made in the United States! These clever trunks come in pink or white and feature a bed that folds off of the interior wall. Imagine, room to store your doll, her accessories AND a bed for her! These trunks are also available without the bed. New for 2006, these patented Doll Duffels feature zippered pockets for a doll's accessories, a deep pocket for the doll and hanger loops for her clothes. The entire duffel zips closed, protecting the doll. 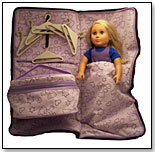 Shoulder straps can be used to port the doll wherever a child goes. This Limited Edition Duffel for 2006 features a fleece interior with a teddy bear, heart and star pattern. Along with the other great features that all of our duffels have, the Limited Edition also includes 6 hangers (color may vary) and a matching accessory tote. The duffel measures 12"x25", the hangers are 5.75"x0.25" and the accessory tote measures 10"x7.5"x6". The duffle has a nylon exterior and cotton interior. The doll is not included. Other doll duffels and trunks are also available.